Join us for the finest sportfishing adventure on Oahu, in Hawaii! Daily Private & Shared Trips Available. 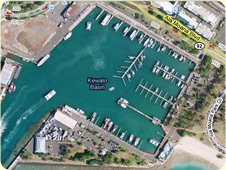 Daily deep sea fishing charters depart 6:00AM from Kewalo Basin, conveniently located next to Waikiki in Honolulu, Oahu. Just bring your food and drink for the day; large coolers and ice are already on board. Catering is available on request. Fishing tackle, gear and license are included. We welcome seasoned anglers or those with no previous fishing experience. Our daily morning briefing covers the details you need to get ready for that first bite! Oahu offers access to some of the best offshore natural fishing grounds in Hawaii to catch big game fish such as Pacific Blue Marlin, Ahi (yellowfin tuna), Mahi Mahi (dorado), Ono (wahoo), and Aku (skipjack tuna). If you want to do some serious sportfishing on the beautiful Hawaiian Island of Oahu, you have come to the right place! 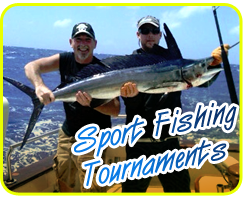 Join us for the finest sport fishing adventure in Hawaii! 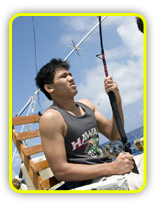 Sport Fishing in Hawaii since 1950, Inter Island Sportfishing was established over 50 years ago by John and Ed DeRego, fishing aboard the boat Stella Maris (Star of the Sea). Over the years, several boats have been retired and replaced by our current fleet of three boats; the one and only Maggie Joe, everybody's favorite fast and fancy Sea Hawk, and our newest addition Ruckus, are all available for charter on Oahu!